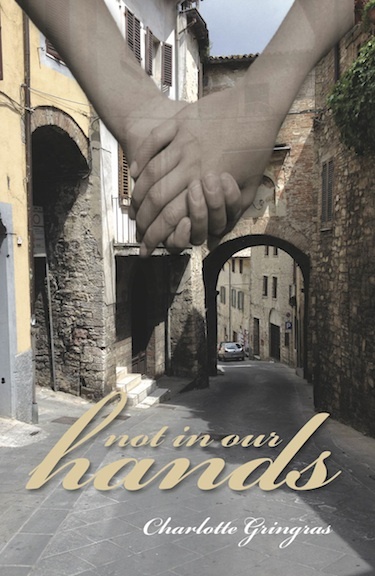 February 14th sees the publication of the e-version of Not In Our Hands. I know you all remember that date for other, romantic reasons but my second novel does contain romance, too, and my trusted and clever editor, Helen Sandler at Tollington Press chose the 14th as it’s precisely one month after the launch of the print version. Thank goodness I didn’t go down the untested route of formatting my own Kindle version for this, or for my first novel, The Purple Rose. I actually thought that Helen’s e-version of The Purple Rose was the best presentation of an e-book I’ve seen, with hyphens in the right place, lines set out logically and so on. Yes, of course there was lengthy soul-searching about the financial advantages or rather, disadvantages of putting an e-book out there, since I receive so very little per book. It works out that from the asking price of £4.99 per e-book, I receive £2.88. 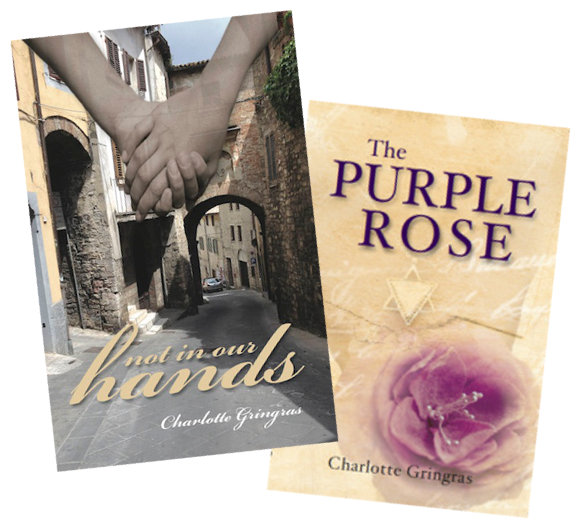 And we’ve dropped the price of The Purple Rose to make it attractive for people who want to read that first, which has already happened at book shop events I’ve attended. But look how the readership can spread – if you self-publish, it’s impossible to balance the importance of returns on your money with the wish to have as many people as possible reading the book that you have written. I – and you – want both, but we can’t have it all. Similarly, I also get as much of a thrill seeing my books in libraries as I do on any book shelf – long may libraries live! Naturally, it does matter to me to try to ‘break even’, as I did with The Purple Rose, but knowing that more people will read that and Not In our Hands because they are e-books as well, is a good – if not as good – a feeling. Two words you don’t want to hear! I am working hard on promotion events at the moment, two last week and one this Thursday in central Manchester. It’s hard work, distributing posters, leaflets, contacting friends and groups and liaising with the bookshop managers to make sure everything goes smoothly and that the events are busy. So the last two words I wanted to hear this week were ‘Weather Warning’! Plummeting temperatures and snow are forecast – so come wind, come weather – but please let the people come too! 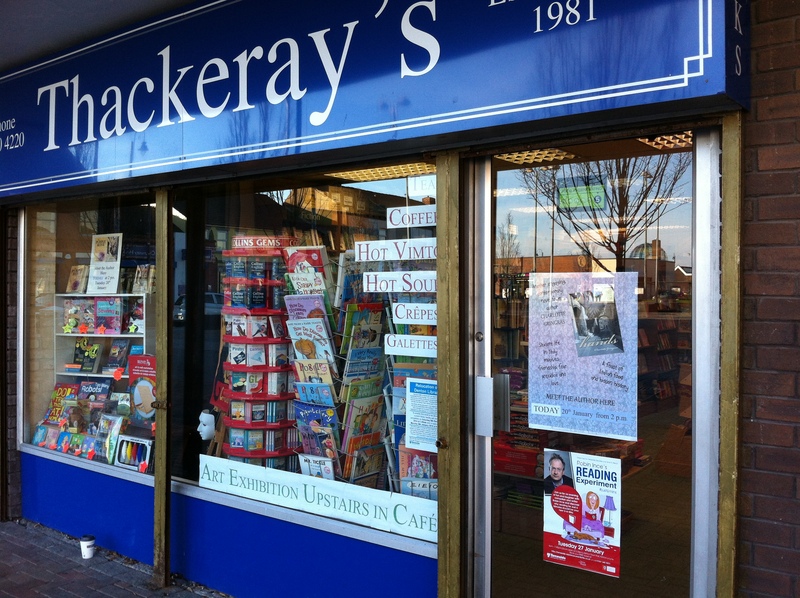 Thank you to the lovely people at Thackeray’s in Denton and Inmans in Didsbury for all their hard work and support last week. It is always lovely after the solitary writing process to get out there and meet people who love books as much as I do and even lovelier when some of them buy my books! Look forward to seeing you 5pm Thursday 29th January at Waterstones Grand Cafe on Deansgate central Manchester. So it’s finally here – the publication of ‘Not in our Hands ‘. To me, it seems to have been around for so long that I’ve kind of lost touch with the excitement I should feel. I’d welcome feedback from any readers particularly on Goodreads and Amazon where both my novels are available. Although this brings it’s own anxieties, what will people say? Will they be congratulatory, cruel or constructive? I need people to read and enjoy it…just for now it’s like when you bake your best cake and no one eats it. 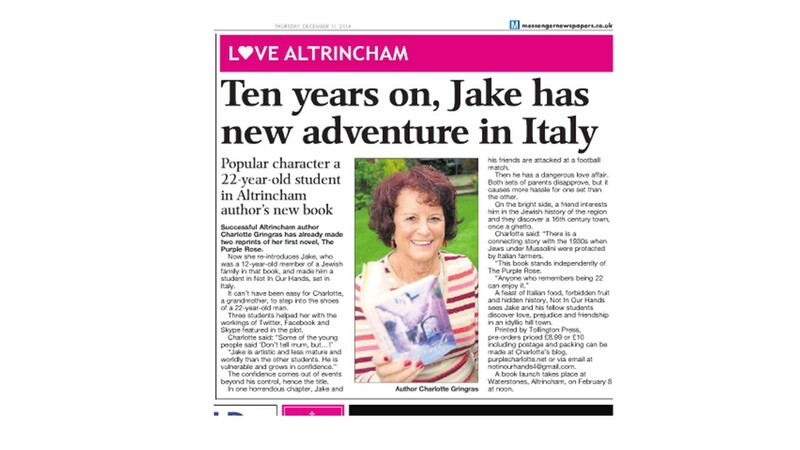 So , readers out there, buy a copy, light the fire, snuggle up in a onesie with a hot drink and bury yourself in the novel, in the warmth and beauty of Italian sunshine, scenery and cuisine. Join Jake and friends as they adapt to new surroundings & experiences while studying in Umbria & Tuscany. And let me know – does it remind you of being 22 like them? Independent but not quite; in touch with your identity – or maybe not. Knowing how to handle falling in love? Publication is 5 days and counting! 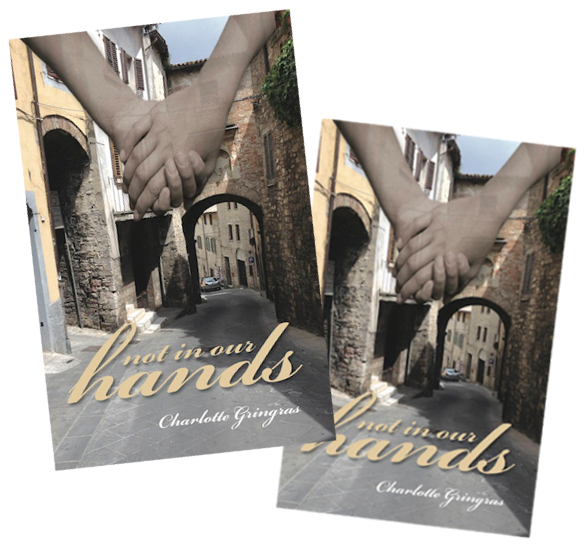 Excitement, trepidation, anticipation, joy, even exhaustion – I am feeling all of these and more since the advance copies of Not In Our Hands arrived in time for Christmas. I’ve been planning the launches, distribution and marketing for months. Writing – and even editing – the book was easy, compared to the pressure exerted by this phase in the book’s life and mine. There have been three previews of publication in print so far and I have a radio interview booked for Monday. I’ve been so lucky in having offers of launches in four shops and counting, all spread so far from each other around Manchester that they won’t be competing directly. But soon, there’s the bit I really enjoy – as well as the launches themselves – speaking to groups, here and there. So many people belong to groups which invite speakers, some every week, which takes effort on their part but very little on mine. So I’m keeping my head down till next week is over and the next journey begins. With an unconfirmed invitation to a Lit Fest, thing are looking good. The publicity merry-go-round begins! This is the first published interview (in my local newspaper) with more lined up and a radio date in the new year. I take receipt of the books from the printers next week and there are already several bookshops, festival programmers and reviewers waiting for them prior to official publication in January! Have you placed your order yet? Please send a cheque made out to Charlotte Gringras for the appropriate amount Enclosing your name and address. Writing a novel is just the start! I used to think that having the idea, structuring the plot, developing characters and writing 100,000 words was the hard part of writing a novel but how wrong I was! Editing, redrafting, cover design, working with a publisher, working with a publicist … and then there’s the marketing! Never underestimate how much time it will take to sell your book. Between coordinating and attending a long list of media interviews, readings and launch events I don’t know if I am coming or going! It’s a strange experience thinking of yourself as a brand and your book as a product but it’s absolutely essential if you are to define your market and target them effectively. So this week I have mostly…been confirming launch events in and around my home city Manchester and providing copy for a city-wide Jewish magazine and giving an interview and attending a photoshoot for my local newspaper. 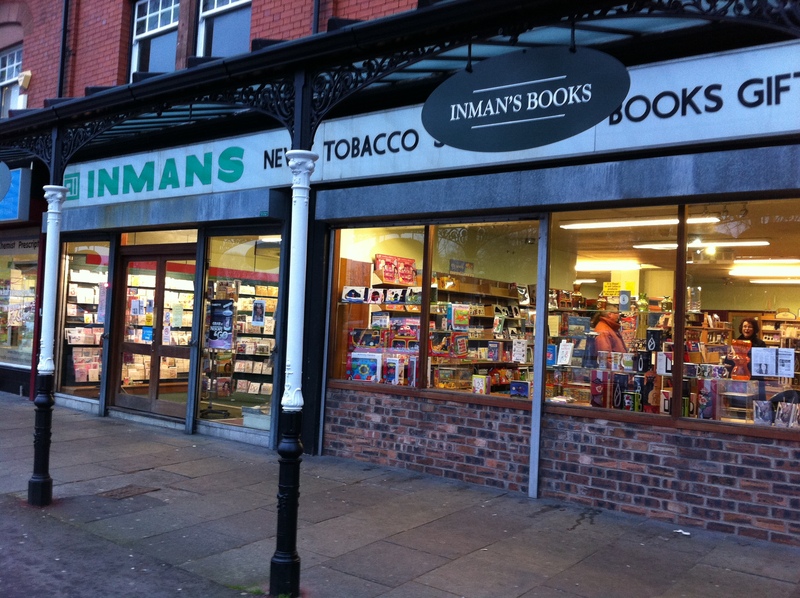 If you are reading this in the north west of England it would be lovely to meet you at Inmans in Didsbury on 23 January, or Waterstones Grand Cafe on Deansgate, Manchester on 29 January or in my local branch of Waterstones in Altrincham on 8 February.